2015 Lincoln MKX! Buying a vehicle can be a stressful time. WE CAN HELP make it worry free and easy. How is this worry free? Our team of highly trained Auto Technicians do a full safety inspection on each vehicle. On sale now! This vehicle was originally listed at $39588. We've marked it down to $30188. You save $9400. Whether you're drawn to its luxurious interior, handsome styling, or flexible versatility, the Lincoln MKX has a lot to offer in a luxury crossover. 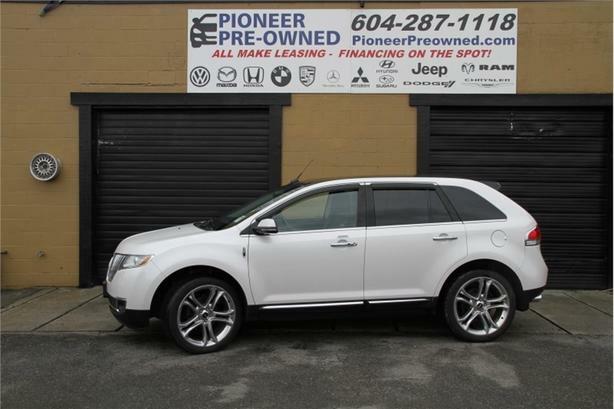 This 2015 Lincoln MKX is for sale today in Mission. The 2015 Lincoln MKX is an excellent choice for anyone looking for a comfortable, well-appointed crossover SUV. It has a sleek design highlighted by a signature Lincoln grille that lets everyone know you are riding in luxury. It handles well, is very spacious, and leaves you wanting for nothing but more time behind the wheel. This SUV has 53797 kms. It's white platinum in colour. It has a 6 speed auto transmission and is powered by a 305HP 3.7L V6 Cylinder Engine. It has some remaining factory warranty for added peace of mind. To view the original window sticker for this vehicle view this http://www.windowsticker.forddirect.com/windowsticker.pdf?vin=2LMDJ8JK6FBL24185.